Hazibags come in different capacities and are designed for a variety of material streams and sizes of job. This conveniently sized bag is the most recent addition to the Hazibag range. Holding the equivalent of one drum, the 200 litre Hazibag is suitable for smaller jobs. Certified for Packing Groups II and III, the 200 litre Hazibags are ideal for emergency spill response, COSHH waste including mastic tubes, paint tins and sealants. This standard bag holds the equivalent of an intermediate bulk container (IBC) or five drums. 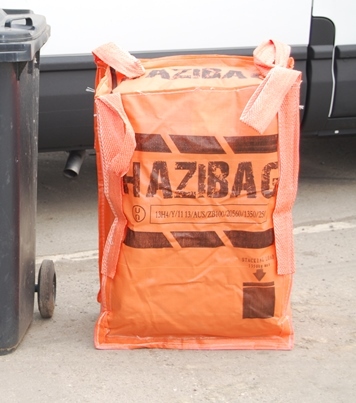 Certified for Packing Groups II and III, the one cubic metre Hazibag is ideal for emergency spill response, COSHH waste, contaminated soil and Japanese knotweed. This lengthy bag is certified for Packing Group II and III and is ideal for full sheets of asbestos. We also provide support frames for the 200 litre and one cubic metre Hazibags and hazardous waste signage to facilitate safe and correct usage. Call us on 01708 55 99 66 or email enquiries@hazibaguk.com for quotes and information.